Apartment, EG, with 1 bedroom, approx. living space 25 m2, Terrasse, suitable for up to 2 persons. Specialties: Idyllic and romantic retreat in the middle of the island Price: from 45,00 eur/day. Apartmentanlage, EG, with 1 bedroom, approx. living space 55 m2, Terrasse, suitable for up to 3 persons. Specialties: Cosy apartment complex with pool at the seaside, golf course closer than 5km Price: from 45,00 eur/day. Haus, EG, with 1 bedroom, approx. living space 55 m2, Terrasse, suitable for up to 2 persons. Specialties: Beautiful and recently renovated house in a lanzarotenian village in the center of the island Price: from 45,00 eur/day. Apartmentanlage, OG, with 1 bedroom, approx. living space 50 m2, Balkon, suitable for up to 2 persons. Specialties: Heated swimming pool, beautiful sea views, non-smokers, golf course closer than 5km, quiet situation in Puerto de Carmen Price: from 54,00 eur/day. Haus, EG / OG, with 2 bedrooms, approx. living space 90 m2, Terrasse, suitable for up to 3 persons. 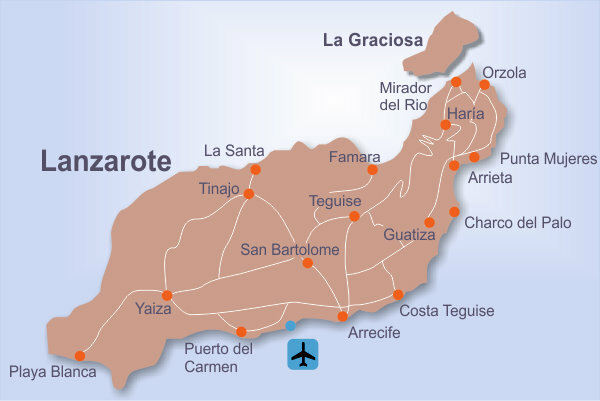 Specialties: Beautiful and original Lanzarote Finca in Yaiza, Internet available. Price: from 55,00 eur/day. Apartment, EG, with 1 bedroom, approx. living space 45 m2, Terrasse, suitable for up to 2 persons. Specialties: Small luxury apartment, fantastis view over the Atlantic, Internet DSL, non-smokers, golf course closer than 5km Price: from 75,00 eur/day. Haus, EG, with 1 bedroom, approx. living space 60 m2, Terrasse, suitable for up to 2 persons. Specialties: Romantic retreat, beautiful garden, internet available Price: from 75,00 eur/day. Haus, EG, with 3 bedrooms, approx. living space 160 m2, Terrasse, suitable for up to 6 persons. Specialties: very nice and well trimmed villa, sea-view, nonsmokers only. Internet access via WLAN Price: from 79,00 eur/day. Haus, EG, with 2 bedrooms, approx. living space 140 m2, Terrasse, suitable for up to 4 persons. Specialties: Very nicely maintained, old lanzarotenian house with great views, non-smokers. Price: from 79,00 eur/day. Haus, EG, with 2 bedrooms, Terrasse, suitable for up to 4 persons. Specialties: Luxurious Villa, part of Finca la Crucita, very nice situated in Haría, swimming pool, Internet access Price: from 85,00 eur/day. Haus, EG, with 3 bedrooms, Terrasse, suitable for up to 6 persons. Specialties: A big villa, designed and built in an traditional style, with swimming pool, Internet access Price: from 85,00 eur/day. Haus, EG, with 1 bedroom, approx. living space 80 m2, Terrasse, suitable for up to 2 persons. Specialties: Beautiful anarian house, large patio, internet available Price: from 85,00 eur/day. Apartment, EG, with 2 bedrooms, approx. living space 70 m2, Terrasse, suitable for up to 4 persons. Specialties: Wonderful panoramic view, very good equipped, heatable sea-water pool, Internet DSL, golf course closer than 5km Price: from 100,00 eur/day. Haus, EG, with 3 bedrooms, approx. living space 200 m2, Terrasse, suitable for up to 6 persons. Specialties: Luxurious villa with pool and sea view. Golf course nearby Price: from 100,00 eur/day. Haus, EG, with 5 bedrooms, approx. living space 150 m2, Terrasse, suitable for up to 7 persons. Specialties: Beautiful and luxury villa with private pool near Golf Course Price: from 107,00 eur/day. Haus, EG, with 1 bedroom, approx. living space 55 m2, Terrasse, suitable for up to 2 persons. 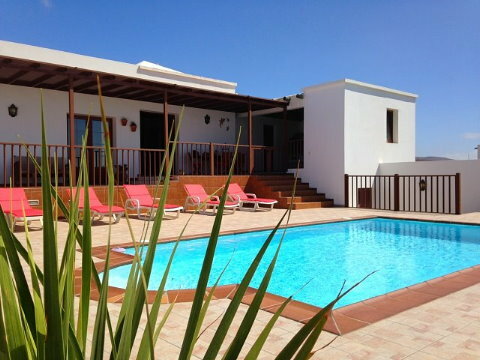 Specialties: Small luxury bungalow, fantastis view over the Atlantic, Internet DSL, non-smokers, golf course closer than 5km Price: from 145,00 eur/day. Haus, EG, with 1 bedroom, approx. living space 100 m2, Terrasse, suitable for up to 2 persons. Specialties: Luxury bungalow, architectural highlight, fantastic panoramic view over the Atlantic, Internet WLAN, non-smokers, golf course closer than 5km, Jacuzzi Price: from 195,00 eur/day. Haus, EG, with 3 bedrooms, Terrasse, suitable for up to 6 persons. Specialties: Very luxurious Cottage, master villa of Finca la Crcita, indoor swimming pool, bodega, Internet access Price: from 250,00 eur/day.